Our last Antarctic landing, Port Lockroy, was a bittersweet morning. 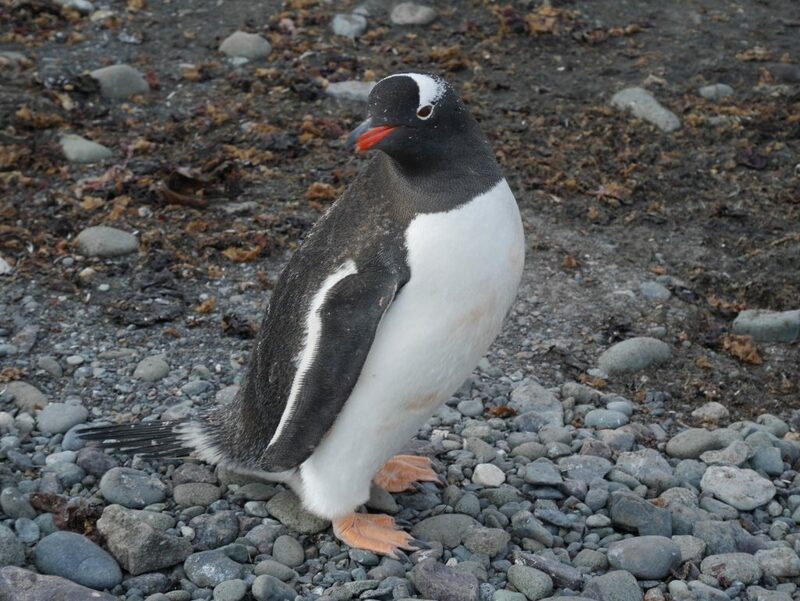 As elsewhere, I was enchanted by the Gentoo penguins, who go about their business unconcerned by the clicking paparazzi. Although we’ve seen thousands of these adorable birds over the past few weeks, I couldn’t resist taking another dozen photos and inadvertently adding my voice to the squeals of delight when we witnessed one penguin blasting a neighbour with a stream of hot, fishy penguin poo. The penguins look quite at home on Gouldier Island, with their painstakingly constructed nests snuggled right up to the solid foundations of Bransfield House. I linger on the tiny veranda, admiring them from above: the beautiful concentric pattern penguin, encircled by rock nest, encircled by a halo of white stripes reaching outwards. Penguin poo art. Then I steel myself and join the masses inside, consumerism resurging after a fortnight without shopping. 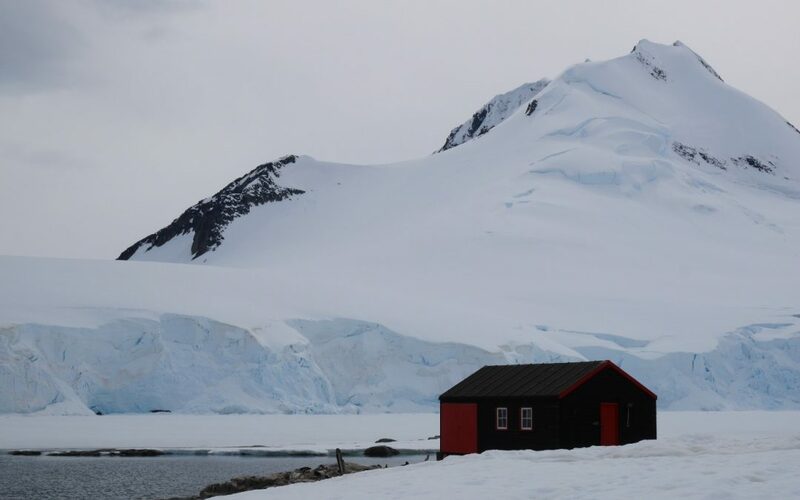 Bransfield House, the most visited location in Antarctica, now houses a gift shop and museum, a meticulous restoration of the working life of this scientific research station, as it operated from WWII until 1962. The gift shop was full to bursting, so I shed my outdoor layers and, with a strong dose of sadness that our days of learning together on this incredible land of ice are about to end, tiptoed further inside. Soon we will be home, thrust into the mass consumerism that has become Christmas. On the one hand, I want to resist the urge to “Buy, buy, buy!”, but on the other hand, I feel a strong urge to bring a little piece of this amazing place back to my family, who have worked so hard to support me to be here. The decision is delayed by the queues and I am transported to another world, back into the clean structured life of science at the bottom of the world. 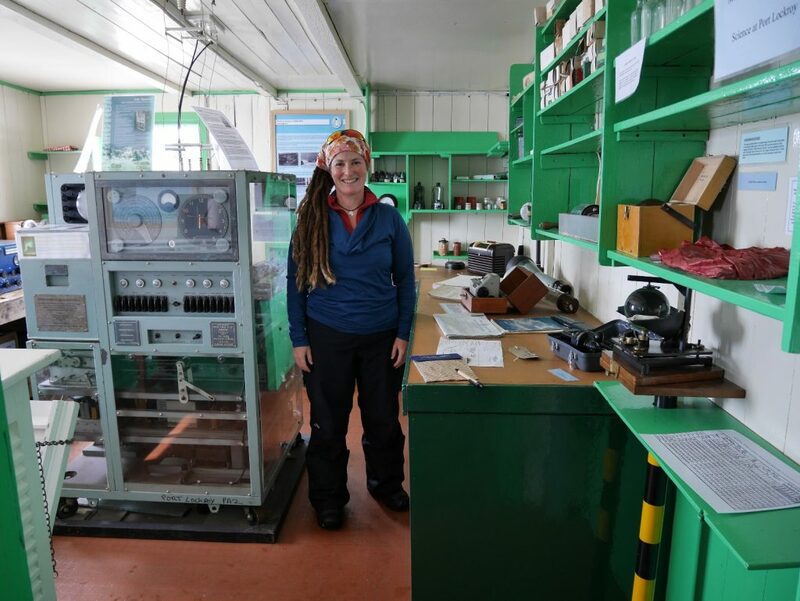 The seriousness of the Radio Room, the practicality of the Workshop, the familiar joyfulness of checked curtains and cocoa in the Kitchen – but with an extraordinary view out over the Gentoo penguins and stunning mountains behind. It was in the Ionospherics Room that I twigged: these are likely the very same conditions, indeed perhaps some of the very same instruments, that Alf Bolza would have encountered when he spent two years down south with the Australian Antarctic Division. Both my step-grandparents, Alf and Nora Bolza, were scientists and have inspired me in my career. When I finally squeeze into the gift shop, I post Alf a postcard. Today, women make up 100% of Bransfield House staff, but when Alf came down, Australia did not allow any women in Antarctica. 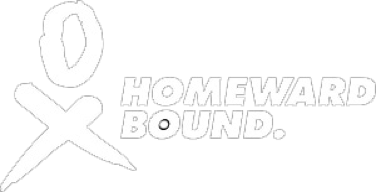 I share my family story, and a tear or two, with a few of the amazing women scientists that I have gotten to know over the past few weeks. So many stories shared, building strength to change our world together. And how that world has changed already, just in the tiny enclave of Port Lockroy. Beneath the steely grey surface of the ocean lie the bones of over 3000 whales, slaughtered here between 1911 and 1931 to feed humanity’s greed for energy and wealth. We have been graced by several visits from these glorious creatures. A sense of calm, palpable from a hundred meters away on deck, emanates from the graceful Humpbacks, the slinky Minkes. It feels like a strange nightmare, that we hunted them to the brink of extinction for their oil. 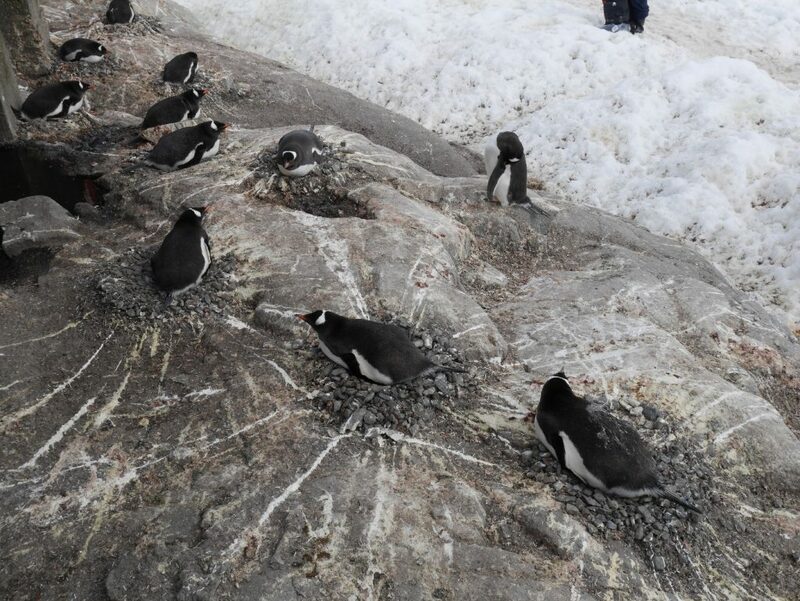 And now, the Gentoo penguins. They did not watch over the whales being slaughtered, or the British manning their meteorological instruments. 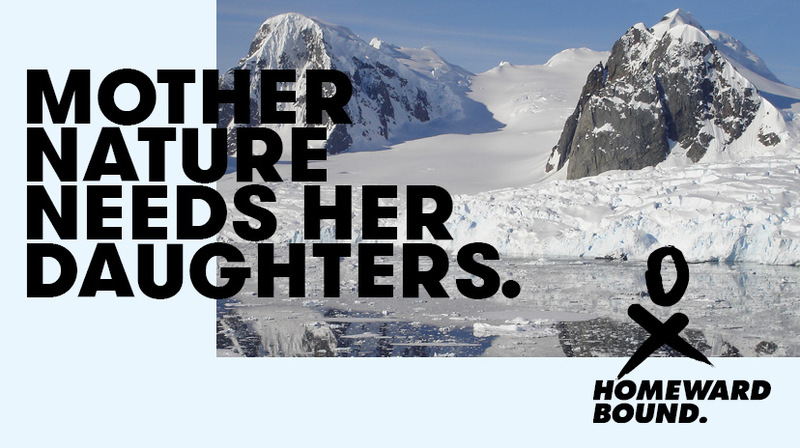 No, they are recent immigrants to Port Lockroy, climate refugees who have migrated south as the Antarctic Peninsula warms, perhaps the cutest evidence of climate change you’ll ever see. Read more about Samantha on our Participants page.